A presentation saber with steel scabbard. The saber has a narrow blade, etched on both sides with patriotic decorations and a gilt brass hilt with a silver grip wrapped with thin braid wire. 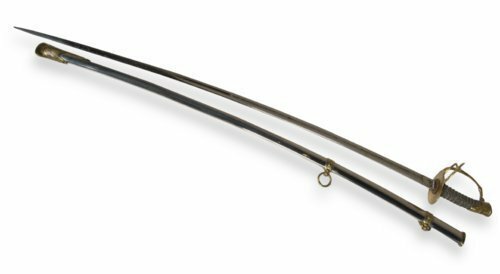 The scabbard has a brass throat, rings and drag, which has cast sunburst design on both sides. Major John M. Brown of Topeka originally owned the saber. Brown served with the 23rd Kansas Volunteer Infantry, which was composed entirely of African American men. He was stationed at San Luis, Cuba, during the Spanish American War, and commanded the 1st Battalion.